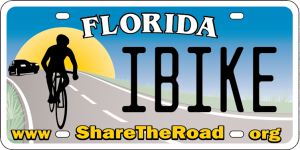 On June 8, 1999, Governor Jeb Bush signed the Share the Road specialty license plate into law. Plates became available for sale in selected counties in Spring 2000. (a) The department shall develop a Share the Road license plate as provided in this section. The word “Florida” must appear at the top of the plate, and the words “Share the Road” must appear at the bottom of the plate. Education and awareness programs, for bicycle safety and motorist safety, with emphasis on sharing the roadway for all users. Training, workshops, educational materials, and media events. The promotion of safe bicycling. The State of Florida Department of Highway Safety and Motor Vehicles (DHSMV) receives updates from tags sold and collected from county tax collectors and tags sold directly through the state office. The DHSMV periodically transfers funds collected through these agencies and forwards payment via check to the Bike Florida office. Bike Florida deducts up to 25 percent and deposits into the Share the Road marketing and promotions account. The remaining balance is split equally between Bike Florida and the Florida Bicycle Association. Funds are distributed to the Florida Bicycle Association on a monthly basis. In essence, this means half of 75% of plate proceeds, or 37.5%, goes to Florida Bicycle Association. Thank you for your support! Bike Florida and Florida Bicycle Association – yes, two separate 501c3 non-profits – share the proceeds with this fundamental difference between the two: Florida Bicycle Association is membership-based and works with federal, state and local entities with regards to bicycling education and advocacy. Bike Florida showcases bicycle tourism and provides bicycling education to the communities visited via multi-day tours around the state. We compliment each other and encourage all cyclists to become a member of Florida Bicycle Association and take a Bike Florida tour. Not a member? How is that possible? If you love bicycling and support our mission and vision, join Florida Bicycle Association. Visit Share the Road website for purchase information. Visit Bike Florida website for more information on multi-day bicycle tours around the state.